The SFX Elders, as we are called, is one of the Ministries of the Catholic Church of St. Francis Xavier, Singapore. We were formed on 23 July 1993 to help our senior parishioners age gracefully in an environment of faith, friendship and fun while maintaining our fitness for as long as possible. These 4 Fs help our members have a wholesome life. 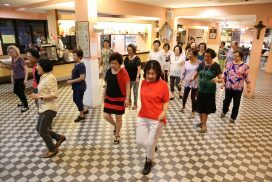 We gather on Thursdays in the church canteen for social activities such as line dancing, mahjong, Rummy-O and other games. During these weekly sessions, we pray and intercede for our own families and for the parish. Once a month, we have a general meeting during which we pray for our priests, religious brothers & sisters, our health, our families and for Singapore. At these monthly meetings, we also share and discuss activities for the coming months. These meetings are also opportunities for faith formation through watching faith based videos or movies, be informed of the latest health advisories and enjoy fellowship with each other through the sharing of pot-luck snacks and birthday celebrations. Over and above these meetings, we organise events and outings. For example, visits to the River Safari, SEA Aquarium, National Museum, Homes & Orphanages, exhibitions, luncheons & dinners and of course, retreats and pilgrimages both locally and abroad. We also visit members who are sick or house bound and try and bring cheer to them. There are no special requirements. We accept people of all faiths, race and gender who can accept that as a ministry within the Catholic church, we practise our faith unabashedly but do not require others to do so. However, non Catholics, must be open to our practises of the Catholic faith not insist we practise theirs. We are also looking for members who not only want to participate but who are also willing to help, suggest & organise activities. We especially welcome young adults who are willing to teach technical skills to older members or wishing to learn from the experience of the Elders.